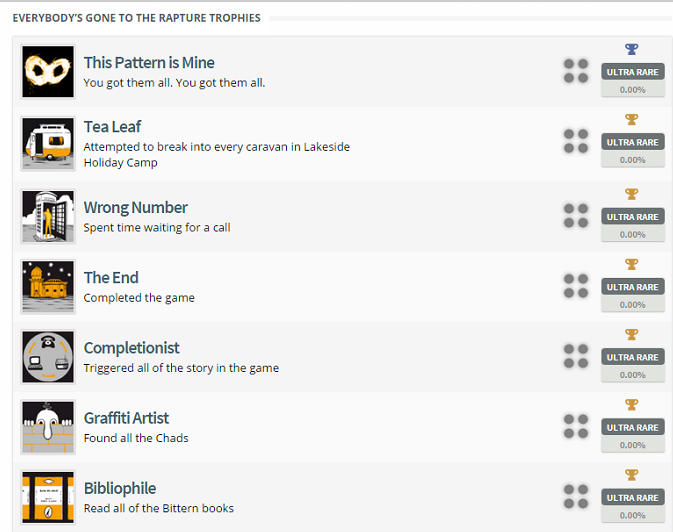 Everybody’s Gone to the Rapture is due out tomorrow, but the game’s full Trophy list has already been revealed. According to Exophase, the PlayStation 4 game will have a total of 19 Trophies, one of which will be a Platinum. On top of that, most of the Trophies are either Gold or Silver, with only a few Bronze ones thrown in. The full list can be seen below, but beware — it may contain spoilers. In other Everybody’s Gone to the Rapture news, The Chinese Room recently mentioned on Twitter that the title will take around four to six hours to complete. It was also mentioned that a physical version probably won’t happen unless the game sells a “very large number of copies.” However, Everybody’s Gone to the Rapture can be pre-ordered and pre-loaded now, or it can be purchased tomorrow when the PS Store updates. Be sure to check out our review of it here.